In the competitive dentist category, Dr. Sturm realized that she could grow her practice by improving her online presence and search engine rankings. With a new condominium being built in the area and universities nearby, Dr. Sturm wanted to capitalize on these opportunities. Pedestal knew this could be achieved with a well-tailored online marketing strategy. 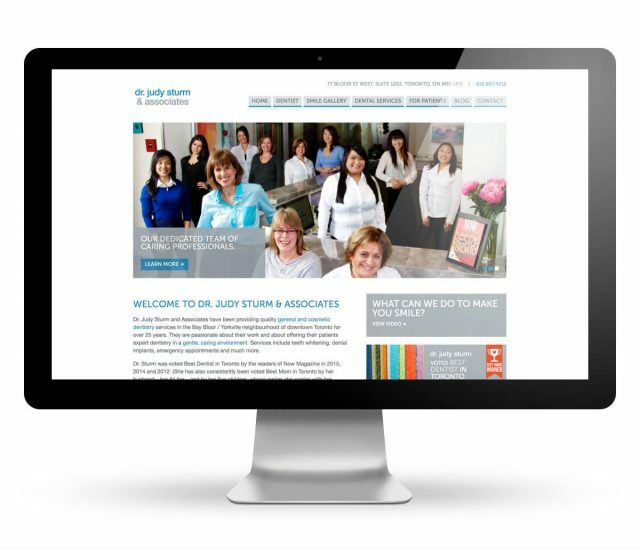 Dr. Judy Sturm is a dentist in Toronto’s Yorkville neighbourhood. Dr. Sturm had worked with a different online marketing company before and even tried her own hand at managing an AdWords campaign, both yielded limited success. Increase the number of new patients generated through the website or by phone. Improve online search rankings so that Dr. Sturm’s practice could outrank its competitors. Attract qualified leads, which turn into appointments, through online channels. Pedestal began by getting to know Dr. Sturm’s business, this included a detailed assessment of her dental practice and local competition. Analyzing this information laid the foundation of Pedestal’s opportunity assessment and strategy. The Pedestal team began by finding strategic keywords, then building a strategy around them which would allow the business to grow in a highly competitive category. The first month of the search program yielded a 223% return on investment. Determined which services would have the best ROI on AdWords and built a profitable strategy around these insights, which delivered nearly a 660% ROI. The website began ranking for keywords that the website previously wasn’t ranking for.